Coupon is good for 1 visit on labor only, cost of material is not included. All service calls are billed by the hour with a 1 hour minimum charge. Many houses constructed pre 1950's have what is called knob and tube wiring. Whether you have this type of wiring in your home or not can be determined by having an electrical inspection of your house done by the expert staff from Elite Electric Inc. Sometimes KNOB and TUBE wiring is not easily visible. You may gain some insight by looking at your electrical outlets and switches. You may only have two prong receptacles (plugs) to plug into. No ground at your receptacles (plugs) means it is possible you may have knob and tube wiring present, also if you have older pushbutton switches, this is a sign you may have knob and tube. These days, homeowners with knob and tube wiring may find it difficult or impossible to obtain insurance on their home. Insurance companies are reluctant to insure a house they perceive as risky. If your house contains knob and tube, Insurance companies may require a certificate of inspection and compliance from a licensed electrician that all knob and tube has been removed or bypassed and replaced or with modern 3 wire grounded circuits before it will provide insurance for a house. After the electrician rewires your house, they give you a satisfactory assessment, and the insurance company will consider giving an insurance policy on the home. 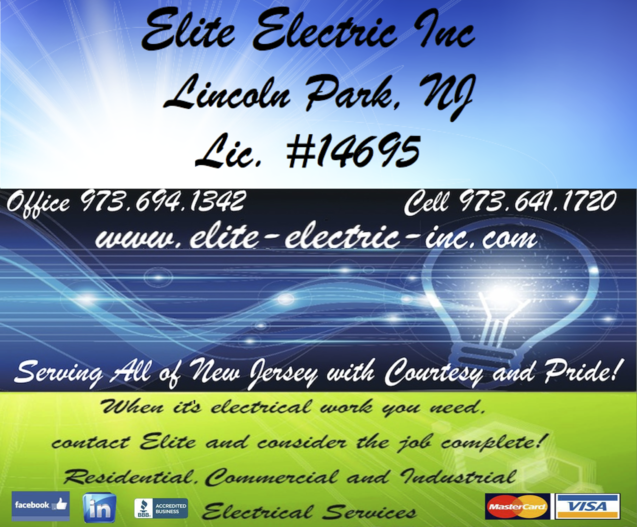 If you live in New Jersey and would like to have you house inspected for knob and tube, or you know your house has knob and tube and you need it removed call us. Where safety and peace of mind is what you get every time! Elite and consider the job complete!